After the Battle of Hastings in 1066, the Normans conquered the rest of England. The leader of the Norman, William the Conqueror, needed to know what he could tax and how many people were in his new kingdom. To do this he sent out people to all parts of his new country. Their job was to find and count every farm, every person, even every pig or chicken. This counting or census was the first in England since the Romans had been there. 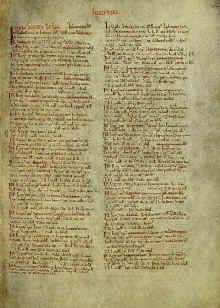 The results were compiled into two books which are called the Domesday book. There are actually two separate Domesday books, the Little Domesday and the Great Domesday book. Under the feudal system all manors had to provide taxes and soldiers to the King. After compiling the Domesday book, William knew how many manors there were. William could tell how much was owed from each manor in taxes and even more importantly, how many soldiers he could get. This helped him considerably when planning how to run his new kingdom. Today we find this book of great importance as it tells us a lot about daily life in medieval times.